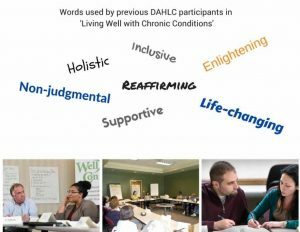 If a chronic condition (blood pressure, anxiety, blood sugar, pain, arthritis, heart disease, depression, or any number of other health issues) has been a concern for you or someone you care for, you may be interested in learning more about the Living Well with Chronic Conditions (LWCC) program. What does 'chronic condition' mean? 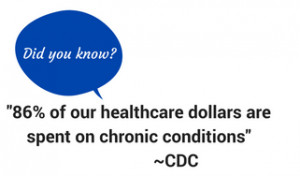 Who has a chronic condition? Do I need to have a diagnosis? What are the age requirements? My shoe is chronically untied . . . and the condition of my car could be improved . . . In the case of the LWCC program, the term 'chronic' refers to 'on-going or constantly recurring'; condition means 'state or circumstance that affects the way a person lives'. So, would chronic back pain be included? Yes. What about obesity? Yes. Obesity is a condition of being chronically overweight. Do I need a doctor's note? No. What kind of activities take place during sessions? May my caretaker or spouse join me in the class? Great question: A caretaker or spouse (or friend, sibling, parent) may only join the group as an active participant and work through the program alongside you. This means also being a DAHLC member, paying for the class, and participating in curriculum, brainstorming, and action plans.